In 1922, Einstein was at the Imperial Hotel in Tokyo, where he was on a lecture tour, and had recently learned that he had won the Nobel Prize. When a bellboy delivered a message to the physicist, he fished in his pocket for some change to tip him and came up empty. Instead, Einstein offered a tip in the form of his theory on how to have a happy life. “A calm and modest life brings more happiness than the pursuit of success combined with constant restlessness,” he wrote in German on a piece of hotel stationery. Einstein told the bellboy, according to the auction house, that if he was lucky, the notes might become more valuable than a regular tip. His words, befitting a man who had transformed our comprehension of the universe, were prophetic. 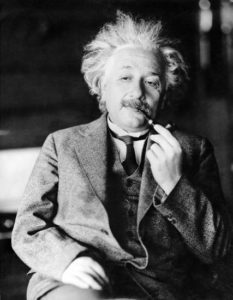 On Tuesday (Oct. 24, 2017), Einstein’s theory of happiness was sold by Winner’s Auctions and Exhibition, based in Jerusalem, for $1.56 million, adding him to the pantheon of the world’s most generous tippers. 1. Do you have any favorite quotes, motto’s or theories? 3. A tip or gratuity is an amount of money given by a customer to a service worker. It is usually voluntary and is a way of showing gratitude to services rendered. It is also believed to provide motivation for greater worker effort. What do you think about giving tips? What are the standards of giving tips practiced in your country and what should tourists from tip-giving countries bear in mind when they’re in Japan and want to give tips?